There are numerous variations and routes around the Park which can be varied depending on your hire time and how fast or hard you would like to pedal. The main circular trail route is the Tamsin Trail which is a 12km shared leisure path around the Park. 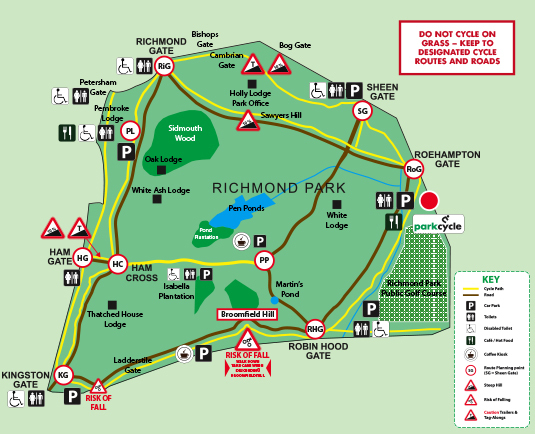 Horses are prohibited from this path which is specifically designed for cycling and pedestrians and was funded by The Richmond Park Charitable Trust. In addition the Park lies on the Thames Cycle Route which starts from Hampton Court and goes to Dartford following the Thames for most of its course. You will see the route through the Park marked on the official Park maps. To assist you in planning your cycling outing we have prepared a number of suggested routes which will give you an idea of time / distance for various levels of speed or ability. Please click on menu tab "Planning your Cycle" for more details. Penalty Notices may apply for not keeping to designated cycling routes or speeding. Please note that Police Officers are now able to issue Penalty Notices, which carry a £60 fine for a number of offences in the Royal Parks including failure to adhere to the designated cycle routes. For further information on penalty notices and regulations click here.